Franco Morbidelli and Fabio Quartararo set for a new and exciting era, as Malaysian outfit makes history, with first steps in the premier-class tomorrow at Valencia. The big moment has arrived for the PETRONAS Yamaha Sepang Racing Team, as it prepares to become the first Malaysian team ever to contest the MotoGP World Championship, with the first test of the 2019 preseason tomorrow (Tuesday). It is sure to be an unforgettable day for the new team and for Malaysian Motorsport, who will witness the first steps of one of their most exciting projects. Italian rider Franco Morbidelli, fresh from being crowned as the 2018 MotoGP Rookie of the Year in Valencia, and Frenchman Fabio Quartararo, who himself makes the step up as a rookie after an impressive year in Moto2, make up an exciting partnership that will take to the Yamaha YZR-M1 machines for the first preparations for the 2019 season at the Ricardo Tormo Circuit, where the final round of the season took place yesterday. With two days of tests ahead, the first objective for both riders will be to adapt gradually to their new team. It is a huge and exciting dream come true for Malaysia and the team that has grown from Moto3 in 2015, to span over all three classes, with the addition of Moto2 in 2018. 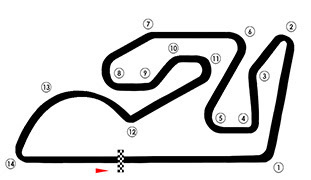 The newly formed satellite team will make its debut into MotoGP, at the first official winter test, with the track opening on Tuesday morning from 10am-5pm GMT +1. “It is an incredible feeling to start this new project, this dream we have had for a few years now, and to do it alongside PETRONAS and Yamaha is something special. Over the last six months we have been working non-stop and it has been very tough but finally we have a great team and great people on board. The relationship with Yamaha is very good and the riders are incredible - Franco [Morbidelli] has a year of experience now in MotoGP after finishing as the Rookie of the Year, whilst Fabio [Quartararo] has an exciting debut season ahead.